Hello. I'm Carlos Patrício, Owner/Centre Director of Mathnasium of High Park, your neighbourhood math-only learning centre. We help kids in grades 1-12 understand math by teaching the way that makes sense to them. Our centre is located on Windermere Avenue between Jane Street and Runnymede Road just around the corner from the Royal Bank of Canada. 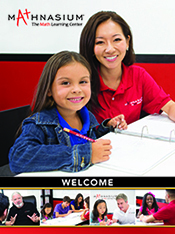 Call us today at (416) 762-MATH (6284) for a FREE consultation and 1 FREE trial and see how we can help your child! Carlos and Thomas are fabulous and so are the teachers they employ! My daughter never complains about going. She is more confident in her math abilities and her marks in school have improved. She rarely has math homework and we NEVER have to help her anymore! He is always eager to go to his session and likes all of his tutors. He has had some amazing tests scores. I am hoping this past year inspires him to see himself more positively with respect to being a student. Thanks for all the help with him. I would highly recommend Mathnasium at High Park to any parent that is thinking about getting some extra help with math for their child. The instructors really take the time to teach and explain the math concepts to their pupils. The appointment set up is very convenient. Keep up the great work! Highly recommended ,i am very happy with mathnasium of high park. Before we found High Park Mathnasium we were frustrated, stressed and very anxious about mathematics. I vividly remember the fist day that our daughter went to Mathnasium - beginning in Grade 9 with the TDSB curriculum. They accepted her right away and started working with her immediately. We had been to other math tutoring services before and had given up, as the specially timed intake appointments, test, waiting for results, payments upfront only compounded our frustration and negative emotions towards math. Mathnasium was totally different. They understand how to first deal with the frustration and downright anger we felt towards the public school math approach and the lack of real teaching that was going. It is so hard to find a good math teacher! Jessie's whole attitude towards math changed when she started going to Mathnasium. After the first day of dropping her off, she was eager to return and from then on worked hard to understand and was motivated to work harder. Mathnasium tutored, coached, mentored and taught Jessie with a wide variety of curricula, including Toronto District School Board (TDSB), the International Baccalaureate (IB) and the Standardized Aptitude Test (SAT) for acceptance into American universities. Throughout the 4 years Mathnasiums maintained it's very high standards and never let us down. They continued to be generous with their time. It may not be good to advertise the fact that Jessie often popped into Mathnasium on an emergency basis - like the night before a quizz or when she forgot to book a time slot or when she wanted to stay after closing to keep working on a problem. Mathnasium always accommodated her in a friendly, professional manner. Again, they made it such a positive experience. Their services are worth more than just the improved math grades and SAT scores. I really appreciate how they managed to diffuse the tension and made the stress over math disappear. We are currently waiting to see which university she will be accepted into; but, feel relaxed and confident, as Mathnasium enabled her to do her best. My daughters enjoyed attending Mathnasium and we could see a big jump in their math skills. They liked the teachers and I liked the help they provided through their explanations. We are taking a break for a few months but we will be back as the benefits are evident. I continue to see an improvement in my children's confidence when it comes to math. The staff is great and accomdating. My sons school teacher noticed a massive improvement in his performace and confidence at school. I like that Mathanasium provides an environment where kids are taught to focus for one hour on something important. The environment fosters the importance of math and the students learn to take math more seriously. The they practice math, the better they get, build their confidence, and want to strive to do well in math at school as a result of attending Mathansium. Although good in math, my daughter has been regularly practicing at Mathnasium for the past two years. She likes it, because she knows that she'll get help whenever needed. The staff is friendly, knowledgeable and create an easygoing atmosphere. A fun place with great instructors. This was the best decision we made for our daughter. She loved it and will go back if and when we need their support again. My son really enjoyed the teachers at Mathnasium. He was prepared for grade 4 math after a summer at mathnasium. A perfect way to enrich and built confidence. It's been a great experience and my kids are more confident and enjoying math. Thomas and Carlos are fantastic. We could not be happier with the program, the instructors and the progress both our kids have made since joining more than 2 years ago! I was greatly impressed by the thoroughness done on the assessment of my child. They were kind, patient and attentive to my son and he enjoys attending Math each week. Good energy, and good student engagement. My daughters enjoy their time at Mathnasium and the owner seems passionate about the subject. I love the flexibility of bringing my daughters at a time and day that is convenient rather than at a preset time. It has been working out wonderfully for us thus far. Very pleased with the result and the resulting improvements on their report cards. My daughters love to attend the sessions. Especially appreciate the efforts and kindness demonstrated by Steven, Thomas and Carlos. Warm regards, [FIRST NAME REMOVED] Strzelczyk. Last year my then 15 year old was struggling in his grade 10 math class. Going to Mathnasium gave him the confidence he needed to approach math learning with a more positve attitude. His grades and his confidence went up. Program is excellent but quite expensive because the rates are similar to those for a private tutor. However, Mathnasium does a great job of keeping kids interested and engaged with Math. We saw our son's grade improve. It's sad that Ontario needs programs like Mathnasium to fill in the shocking and unacceptable gaps in the current math curriculum, but we do. Our experience was very good. Really increase our daughter's confidence with math. When she started with Mathnasium she was struggling. By the end of the school year she was helping her classmates with math problems and she finished the year with a great mark! My son received personalized math lessons in a relaxed and supportive environment which helped him to learn concepts and to fill in knowledge gaps without the stress of constant testing. Teaching for understanding. Highly recommended. The kids enjoy going and learning new concepts. Our grade 10 student actually like to go to you to learn math! His enthusiasm in understanding math concepts is great to see. Elise absolutely loves going and we have seen her confidence and marks improve. Thank you very much. My daughter enjoys going to Mathnasium. She also has noticed an improvement in her grades. It has given her the confidence she needs to know she can accomplish doing well in math with hard work. Great teachers, that make it an enjoyable experience. Convenient location and user friendly booking system that makes it easy to book time slots with multiple options. Daniel feels more confident when it comes to takling new math problems. It's not a struggle to get him to go to Mathnasium. My son Aleks absolutely loves coming to Mathnasium. And this is a kid who would be on the verge of tears every time we tried to work on math problems at home together. Carlos is also very accommodating and has a calming presence so it's evident why he's such a great mentor/teacher. All of the tutors that Aleks has had are really great. He's in grade four and for the first time since he started school he actually loves math. I like the amount of weekly practice and its regularity. It's great that there is always a number of people available to correct and explain practiced material. Thank you. My son has shown huge signs of improvement in Math. His confidence level has increased a lot and more importantly, he now likes Math ! My son Noah was not confident in math. With mathnasium he gained confidence and is now excelling. This has transfered over to other subjects as well. Noah actually likes to go because of the staff and also the methods of teaching. He enjoys his progressed being acknowledged through points as this is a fun incentive. Mathnasium will be a constant in our education for our son. Mathnasium has increased our daughter's confidence in handling math at school. It has been a good experience for her so far! My kids seem to have fun there and always want to go. The assessments are really useful. Your staff seem to be good at fostering a love of math. My son has been going to Mathnasium for almost 1 year. He always goes to your program with a positive attitude and has never complained about having to be there. His confidence in his math abilities has greatly improved because of your program! Matthew is more engaged in Math and his mark has increased significantly. I liked that you had binders on-site to keep the kids organized - and I liked that my kids went without complaint - it seems they enjoyed the experience! I didn't expect that - I thought my boys would view math tutoring as a chore. Feel free to use my comment but not my name - my kids might not like it. Thx! We have been so pleased with the progress that our son has made with Mathnasium. We believe he has excelled as a result of the individual program put together by Thomas and Carlos for him. We are grateful to be able to continue with Mathnasium this year. Our children gained confidence in their abilities with the classes. It's a great place. Connor has benefitted greatly from Mathnasium. Nicola is coming back. Need I say more? It's a very inviting atmosphere. My son really likes the interaction between instructors and students. I'm happy with the fact my children feel more comfortable and confident learning math. Highpark location knew the teachers in my kids schools & they "way" they teach. Time after time, my son walked out of Mathnasium, saying, why didn't she (his math teacher) just explain it properly in the first place. Both of my kids had tailored learning plans, to take them beyond just doing homework with them every week. The reinforce the importance of having done or at least attempted to do you homework prior to arrival. They knew my kids teachers teaching style, & where they would no doubt run into to trouble. I watched them fix this in minutes. The teacher talked for an hour & my son could not understand this particular topic, yet I watched in amazement, when he "got it" at Mathnasium High Park, after literally 3 minutes... They're also the best structured & financially viable tutoring service out there ! I know because I checked it out before I signed my kids up. You get a sibling discount, allowances for holidays, flexible payment options, just can't say enough good things about them & the different they made. My daughter, as a result got accepted at Guelph University, & my son accepted in the Robotics Program ! very happy. My daughter really likes her teachers because they care. Carlos and Thomas do a great job of working with the kids and encouraging them to work to their potential.. Both my daughters were seriously struggling in math & now with the help of Mathnasium they are succeeding with confidence. Thanks! Alistair enjoys Mathnasium and is highly motivated by the punch cards for assignments completed. The results at school show the time spent is paying off. So far my son really likes it and he aced his first two math tests since starting. It's early days but happy so far. I like the online booking tool. Wish it were a little less expensive. My daughter is happier here than with a tutor because there are always other kids working on math as well. She doesn't feel like she is the only one who needs help. Easy going management with flexibility for scheduling at late notice for busy parents. Atmosphere within the group which creates a desire to come back. Communication of teachers with kids really positive and age appropriate giving inspiration to kids. Our daughter genuinely enjoys and looks forward to attending, and quickly became much more confident about her math capabilities. What more can any parent ask for? My son is improving in his Math!!!! Carlos, Thomas and the entire team at Mathnasium have done wonders to build confidence in Matilda's ability to achieve results in math. Her math marks have improved in leaps and bounds. Matilda loves attending her tutoring sessions at Mathnasium; it is a welcoming, nurturing and fun environment. Matilda actually looks forward to her twice weekly tutoring appointments. We enjoyed our time with Mathnasium and i expect to be back. My daughter is in grade 11 and she needed extra help with her math. She willingly attended all the sessions and was inspired by the instructors. Carlos, Thomas and staff are phenomenal with kids. They really try understand the child's needs and what motivates them. They've become a regular part of our routine as we've seen great results. They also provide us with regular updates on my child's progress which I love! The program has really helped Julia in improving her grades and in gaining confidence enough. Your program has taken a weight off my mind and I recommend it widely. Thanks so much. Good quality tutors. Giving our child a greater sense of confidence to tackle more than math. Thanks! Madelyn enjoys her time at Mathnasium and I think has been doing well. I am anxious to see her report card from school in December - hopefully her time at Mathnasium will have helped with her day to day school work. The only tough part is the two sessions per week. I realize that the kids do much better with the 2 hours per week but when you are on a 9 month plan...2 separate hours per week is a bit tough to schedule with other activities happening. Wondering if a 90 minute session would be possible from time to time? Just looking at options. Our younger daughter Kate is interested in coming as well but will have to wait til Spring until we could manage the 2 hours per week. Nicola is very much enjoying the program. She signs up voluntarily and is keen on getting caught up to her grade 10 class. Connor has benefited immensely from Mathnasium both academically and socially ! My daughter is now much more confident in math and enjoys it. It has strengthened her foundation in math so that it is much easier for her. Great service. My sone enjoys going and feels like it helps him a lot. Tutors are caring and know how to engage kids such that my son goes to the centre on his own. There has definitely been an improvement in his math skills which also helped rebuild his confidence and interest in math. Thank you for all you do. the staff is really good at engaging with students and their methods used for teaching math concepts are working really well. Math becomes understood and liked, not feared. My son has always enthusiastically gone to his tutoring sessions! His math knowledge and abilities have steadily improved, as has his confidence! Alistair really enjoys his time there and he claims it helps him at school (which was the whole idea!). The punch card system definitely motivates him and loves seeing Kirby when he's in, too. I think the 2x one hour sessions works well and I'm interested to see his continued progress in math at school. My daughter really enjoys math, Carlos and his team have helped foster her passion for math even further. Great asset to have this service available in the neighbourhood. Kids are excited to go. They are excited seeing their grades getting better. More confident in class. Sydney really likes it and she tells friends about it. Mathnasium has been a fabulous experience for my son. His skills and confidence in Math have grown rapidly over the past four months. He is eager to attend his lessons and has bridged the gaps in his learning quickly. I highly recommend Mathnasium to anyone who wants to see their child succeed both socially and educationally!